If anyone wants to upload their file here, send me a message. I'm not going to mediate people's patches, I just want a central location where everyone can grab any files and maybe drop some good info. If you're willing to put you name to the file then I am cool with it, just play nice with other authors. The file will have to assimilate to the perms, which are basically open, except for very specific cases. Files should never be removed from this page, only retired. If a file should be removed for whatever reason: append the details to the description, append a warning to the name, and/or move the file to a different section, but don't delete them. I do have a semi automated patcher for xEdit, it's pretty basic and fairly accurate, but it only handles objects. If the future I'd like to drop the requirement of OCS and automagically generate open cities from the game files. It's definitely possible, albeit, very tricky. This would also allow perfect and repeatable results. There would also be a potential of doing special things to fully support uninstalling. There is absolutely no time frame on something on this, it hasn't even left conceptual stage. If either of you are still looking for the solution to this problem: Open Beautiful Cities OCS in SSEdit. Search for 06000f23 (change the first two numbers if Beautiful Cities OCS is somewhere else in your LO). It should be 'Placed Object, SolitudeBaseMarket [0008E2DF]...' . Right click and select "Remove". Confirm, save, and exit. Solitude's disco floor lights should now be gone. Does the Dawn of Skyrim patch also work with the Dawn of Skyrim-JK's patch? Also, thanks for the hard work! Well that's phenomenal, thank you very much! Tea is already working on it. Didn't know that, thanks for the info ! Hey JPSteel, would it be possible for you to take a swing at this again? Tea started a modding hiatus about a week and a half ago, and doesn't look to have ever finished this JK's-DoS-OCS patch. Alternately, I could take a crack at it, but I'd want someone more experienced to review. 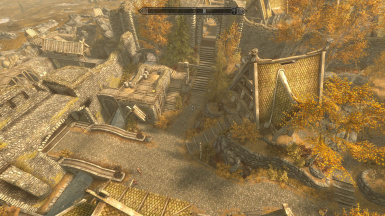 Is the Falskaar patch no longer needed since Version 3.1.1 of OCS has "Riften: A compatibility script now exists for Falskaar to move Jalamar's AI markers into the correct worldspace for the beginning of the quest." Yes, I got a confirmation from Arthmoor himself that it is no longer needed. Any chance of getting a patch for Northern bathhouses? I have uploaded a new (hopefully last) version of the Dawn of Skyrim Patch. It was tested on a heavily modded save and no issue was encoutered. Also the file is now an ESP. 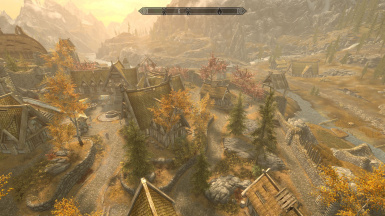 I fixed the formid in the dawn of skyrim Open cities patch so that it stays in formid limits of fff so that it does cause issues as a esl file in case anyway wants it https://www.dropbox.com/s/m7ngnxbv5v1w7ue/Dawn%20of%20Skyrim%20Director%27s%20Cut%20-%20OCS%20Patch.7z?dl=0. 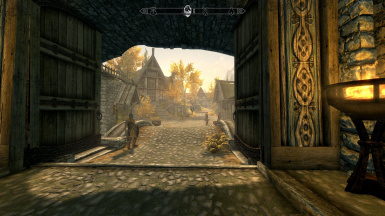 I've been having a lot of issues with the Dawn of Skyrim patch, the biggest problem is that interior doors of new buildings are either doubled up or lead to the old closed worldspace. Is there a easy fix for this? I've been thinking of just dropping Open Cities (which makes me sad) because it's always a hassle to get working stably. Just wanted to let you guys know that your OCS + Dawn of Skyrim patch should not be ESL-flagged. It contains too many records for an ESL and will therefore 'overflow' into the next ESL save slot when the game is launched. This is really bad and can cause anything from unpredictable behavior to straight up crashes. You can easily remove the ESL flag in SSEEdit - open the mod, go to the record header and, under 'Record Flags', unselect the ESL flag. "Individual files flagged as ESL can in theory hold up to 4096 form ID records. In practice this ends up actually being 2048 form ID records because the engine reserves everything from $0x0000 to $0x07FF. All files using ESL flags must therefore contain their internal form IDs between xx000800 and xx000FFF. Anything exceeding this range is invalid and the game will either crash or you'll have severely corrupted data due to overruns." 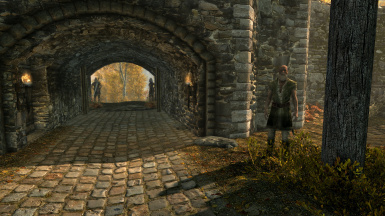 Unflagging the OCS + Dawn of Skyrim patch seemed to have fixed the bug I got in Solitude and prevented Roggvir's execution from playing out normaly [when I first visited Solitude no one but the executioner was in their proper place and Roggvir was chilling on Solitude's walls over the execution plaza (NOTE: since I observered the bug I avoided saving in the area, and reloaded a previous save until I could find a solution. After I unflagged the ESL from the patch i travelled back to Solitude and the scene played out normally)]. 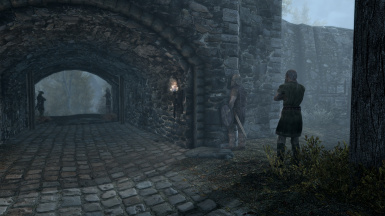 Dawn of Skyrim with Open Cities causes NPC mouths not to move when you walk by or stand in front of them. Their mouths do move again once you initiate dialogue, but freeze immediately if you exit dialogue. 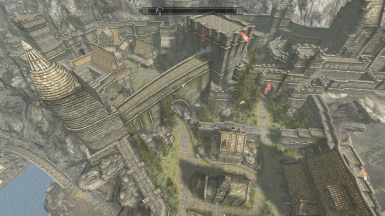 After much testing (deleting all mods, fresh install, fresh game, adding mods back in one by one) I determined this to happen as soon as I add Open Cities on top of Dawn of Skyrim. There are no other NPC or bird mods installed. Has anyone else encountered this before or know a fix? First, all the missing NPCs are clustered inside the model for the Winking Skeever, in the far corner just underneath where Roggvir can be found in that screenshot. This shall henceforth be referred to as the Pit, and for replication purposes I used Predator Vision to find them. Roggvir actually spawns down there too, but is then ejected onto the battlements at some point during his animation. NPCs sometimes fall into the Pit, but seem to find it very hard to get out again. Some, like Taarie, can be removed if you go to an interior cell and wait, but will inevitably end up back in there again. This spot is also just beneath the end of the wooden plank walkway that runs halfway along the wall. As such, my best uneducated guess for how this is occurring is that there's a navmesh error in that region. I think NPCs are routing along the planks instead of up onto the Castle Dour walls, reaching the end of the walkway and then falling through the Winking Skeever's roof into the Pit. I hope that helps you to fix it - it's a bit game-breaking at the moment, as half the shopkeepers are stuck there!